MAYA’s awesome brunch will offer up a special event this Sunday. 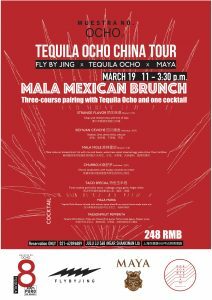 Modern thinking single estate Tequila Icon Thomas Estes and Tequila Ocho will be present for a Mexican Sichuan Brunch with food and tequila pairings. Jenny Gao of Fly By Jing and Austin Hu will collaborate on a fusion menu and MAYITA’s Veronica Bravo creates the cocktails. Brunch starts from 11AM till 3:30PM. 248rmb per person, we are now open for pre-bookings by calling 62896889.